Russia has had the largest rate of net migration alongside Germany and the USA, but not a single museum has appeared here to reflect that fact. If you search for the words “migrant” or “migration” on Russia’s largest museum website, you will not find a single hit. 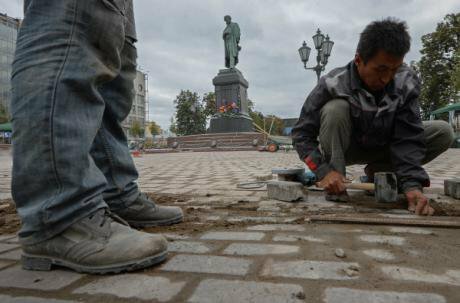 Even if we ignore migrants from outside Russia, this silence looks more than strange. The latest figures from the Internal Ministry’s Main Directorate for Migration reveal that 88% of migrants in fact resettle within the Russian Federation, and only 12% come from other states. But from the legendary invitation of the Varangians to rule Kievan Rus’ in the 9th century to the mass waves of emigration throughout the 20th century, migration has played an immense role in Russian history. To say that the subject is entirely ignored woul be a gross generalisation. There are private and public museums that do deal with migration, as it's an integral part of their story: one example is Moscow’s Jewish Museum and Tolerance Center. Recently, museum projects connected with local identity have started to focus on migration, as the history of many towns and cities can’t be understood without it. The regional history museum in Tomsk, for example, ran a project on “Siberians Free and Unfree”, while Izhevsk’s award winning Gallery exhibition centre is working on a project entitled “The Izhevsk Decalogue.” These initiatives are, however, the exception. So, where all the other other migration stories? We can look at the question from three different angles: migrants’ narratives about museums; historical narratives connected with museums and migration and finally, museum narratives about migration. I would like to ask Viktor a question: how do Russian tourists manage in the Louvre, if they don’t speak two words of French? But in the end, museums’ interest in the subject of migration is hardly surprising: they work with artefacts and works of art, which speak to us in a universal language that everyone can understand (so long as the museum is doing its job). And a focus on migration doesn’t necessarily mean a focus on migrants themselves: it can sometimes be more important to bring the locals’ attention to the concept itself. Although, not necessarily Viktor’s. But we have got distracted from the main question – do migrants in Russia go to museums? A field study carried out in 2014-2017 revealed that fewer than 20% of migrants had never been to a museum. The researchers had individual conversations with migrants (both citizens of other countries and stateless people) as part of a formal procedure where the Moscow committee of the Internal Ministry’s Main Directorate for Migration determined whether individuals in these categories could be categorised as Russian speakers. The committee meets twice a month and has so far assessed 358 people, 11.4% of the total number of aspirants. “The Central House of Artists (more than 10 times – we were fixing the window panes), the Paleontology Museum, the Darwin Museum, the Biological Museum – also for work, you get to see everything (on the sly) at one go; it’s very interesting”. “The museum-flat of the ballerina Galina Ulanova, the Gulag museum…Why those? I just worship the great dancer’s art. I also love Stalinist imperial architecture, especially the high rise buildings – I dream of visiting them all. I haven’t managed to visit Moscow University’s main building – isn’t there a museum there too? But I don’t know when it’s open. I also visited the Gulag museum with a friend: it was very interesting. You need to know your history, so as not to repeat it”. In all, these migrants, who “don’t go to museums”, in fact mentioned 137 Russian and world museums they had collectively visited. We would probably not have had a better response from “indigenous” Muscovites, 70% of whom, according to the Moscow Institute For Social and Cultural Programmes, never go to museums. Admittedly “migrant”, and indeed “Muscovite” are rather abstract definitions that encompass dozens of social strata and population groups. The museum world shows no interest in recognising and studying either category – just look at the description of “target groups” in most projects and schemes run by Russian museums. Nonetheless, if some of these “generic migrants” go to museums, then the passivity shown by the museums can’t be explained by a lack of demand for their services. Perhaps this ignorance on the subject of migration has more prosaic roots – that museums just have nothing to work with. They’d love to tackle the topic, but their collections don’t allow it. It’s an interesting hypothesis, but in Europe, museums of more or less every kind – from Italian palaces and Barcelona’s Maritime Museum to Athens’ Byzantine Museum – run projects on migration. Even Tenerife’s unique underwater Atlantico museum has tackled the subject. Russia’s museums perhaps believe that their collections are so homogeneous as to exclude any reference to migration. But the facts show otherwise. The luxurious palace and grounds of Tsarytsino are in the Top Ten of migrants’ favourite Moscow museum complexes. Visitors to the Tsarytsino park and museum complex in suburban Moscow. Photo CC-by-2.0: Alex1 / Flickr. Some rights reserved.You might wonder how should an 18th century palace address “migration”. But you need to remember whom it was built for — not Yuri Luzhkov, Moscow’s former mayor, but his favourite heroine Catherine the Great. And Catherine, a minor German princess, started off in her own way as an immigrant worker, brought to Russia as a diplomatic pawn with concrete responsibilities, albeit aristocratic ones. The initial function of the palace also had nothing to with a settled existence, but, on the contrary, with the Empress’s constant shuttling between Moscow and St Petersburg. The estate later fulfilled a similar ritual-seasonal purpose in its “dacha” period in the 1870s. 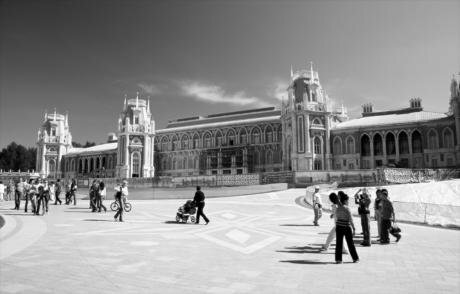 While we’re about it, we can even see the palace’s architecture as a fine example of the migration of styles – the Gothic is not native to Russia. And we mustn’t forget the migration of collections: the museum holds mainly works of applied art from former Soviet republics – that’s right, the same ones that our awful “migrants” come from (we don’t mind their objets-d’art). And let’s not forget the grounds and park – the natural world is an example of regular migrations. Indeed, we have to recognise that it is only the theme of migration that allows us to conceptually and consistently weave Tsarytsino’s numerous strands into a single narrative. It is the same with the State Literary Museum, which was intended as one of the main elements in the Moscow government’s “Museum for Migrants” project mentioned at the start of this article. On the one hand, what have migrants to do with great Russian literature? But migrants have provided three out of Russia’s five Nobel Prizes for literature – and the last winner, Belarusian writer Svetlana Aleksievich (who writes in Russian) is no exception. Even if we turn from national pride to more prosaic subjects, we still can’t deny that journeys (i.e.migration) are at the heart of all traditional literature, whether folk tales, myths or epics. This goes back to the Odyssey and is as true for literature today. In this context it’s interesting to look at the museum devoted to the life and work of the brilliant poet Mikhail Lermontov (1814-1841), a descendent of Scottish immigrants who became one of Russia’s national treasures. This fact may be regarded as both a motivating force for people with an immigrant background and something to ponder for the “indigenous” population. But it is not only famous names who have left their mark on national life: there has been practically universal migration. To see all the places where Lermontov lived and worked you need to go by air. And the themes he chose for his works are full of this migrant reflex – one of his most famous lyric poems begins, “A lonely sail is flashing white/ Amidst the blue mist of the sea!”. There is, by the way, a mass of useful themes for an anthropologist or museum educator in Lermontov’s work: take, for one, the voluntary/involuntary migrant Pechorin, who, like his creator, was exiled to the Caucasus where he tried various ways of establishing contact with the local population. We have to admit here that the problem lies not in the migrants or the art collections, but in peoples’ heads. And in any case, engagement with the subject doesn’t eliminate the “refined racism” in their attitudes to people with an immigrant background. It’s difficult to think of St Petersburg’s Armenian diaspora as migrants, since it has been in existence since 1710, just seven years after the founding of the city. But even that’s not the point. We still feel the need to teach and educate people of other countries and ethnicities, to raise their cultural level to our own, even when a museum is working with people whose culture it is exhibiting. This imperial myth gets in the way of our museums not only engaging with the subject of migration, but of any interaction with real people. How would you like it if you were always in the role of a pupil? Even when attempts are made to draw attention to this issue, the narrative stays the same. 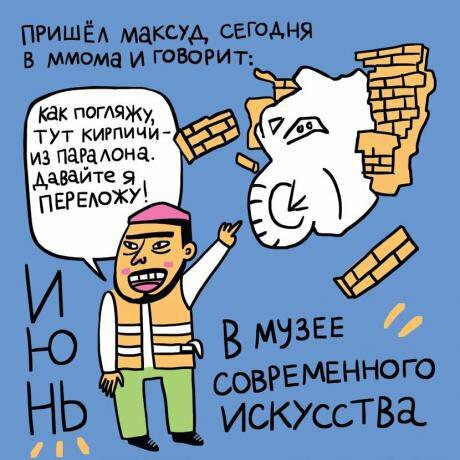 The Moscow Centre of Museum Development brought out a supposedly “humorous” calendar in an attempt to illustrate the subject of migration and inform the public about “the openness of our capital’s museums to every actual and potential visitor”. But it presented all migrants in the form of “Maksud”, a manual worker who speaks Russian badly and knows nothing about contemporary art. When some museum specialists called the cartoon illustrations chauvinist, other members of their professional community complained. Moscow’s Centre of Museum Development published a calendar displaying more or less all the prejudiced views about migrants. Here, a Tajik labourer called Maksud is at the contemporary art gallery. Noticing than a conceptual installation features rubber bricks, he cries “Hey! Let me fix that for you!” Photo courtesy of the author. The Russian state is traditionally seen as the most “European” element of our country, but in this area it is resoundingly at one with the public. Moscow’s Department of Culture analysed the failure of the “Museums for Migrants” project in the following words: “We also ran an experiment: we invited a few Tajiks to a museum, but they all said they would only come if we paid them 300-500 roubles [£4 - £6.50]”. So here we have another fine image of the migrant manual worker from Tajikistan. It’s no surprise that even the few exhibition projects devoted to the subject of migration are incapable of rising above this level. The introduction to the “Migrant Moscow” exhibition created by the Russian Presidential Academy of National Economy and Public Administration states that “in general, these are people from poorer countries who come to Russia on a temporary basis, to take up work not requiring high qualifications of any kind”. Once again, the subject of migration is displaced by the subject of migrants, and we end up with yet another reiteration of the same old story – that migration equals migrants, and migrants are temporary unskilled workers, criminals and terrorists. Russian museums are afraid of the subject of migration and avoid it at all costs, even when it is obvious and natural. And despite successful projects curated by the Museum of the History of Religion, the Museum of Street Art and the Museum of Moscow, this fear stops them creating a unified narrative of migration – something that concerns every one of us.